Copper is an essential trace element. Copper-containing enzymes play important roles in iron and catecholamine metabolism, free radical scavenging, and in the synthesis of hemoglobin, elastin and collagen. Copper is mainly present in caeruloplasmin in the liver. Low levels of copper have been associated with mental retardation, depigmentation, anaemia, hypotonia and scorbutic changes in bone. Levels of copper are key diagnostic indicator of diseases such as Wilson's disease, microcytic hypochromic anaemia and bone disease due to reduced collagen synthesis. 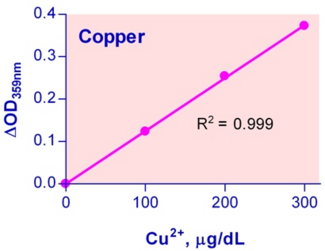 Simple, direct and automation-ready procedures for measuring copper concentrations find wide applications in research, drug discovery and environmental monitoring. This copper assay kit is designed to measure copper with no or minimal sample treatment. The improved Method utilizes a chromogen that forms a colored complex specifically with copper ions. The intensity of the color, measured at 359nm, is directly proportional to copper concentration in the sample. The optimized formulation substantially reduces interference by substances in the raw samples. For quantitative determination of copper(II) ion and evaluation of drug effects on Cu metabolism. Shipped Ambient, Store at Store at 4°C., 6 months shelf life.